A species of long-necked dinosaur that once lived off was discovered in the coast of Africa. A Minnesota paleontologist will soon name it. Kristi Curry Rogers, former paleontologist at the Science Museum of Minnesota, has been working for 10 years to try to find out the new species. 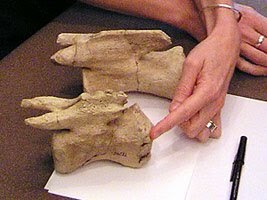 In Madagascar, there were two different species of long-neck dinosaurs bone were found. "It's sort of a historical problem that we always have to deal with because the first named of anything is not necessarily the best example of what that thing might be."